I’m delighted again to share a guest blog post written by Saunders Drukker. Saunders is an Ecology and Biodiversity major at Sewanee (Class of 2017). In my last post on this blog I wrote about how winter was a time of increased activity for the forest dwelling amphibians that inhabit the Cumberland Plateau. Late February is the most active time of all. Towards the end of winter, when relatively warm rains begin to fall, amphibians of all types migrate through the hardwood forest of the Cumberland Plateau and set up temporary residence in water-filled depressions known as ephemeral ponds. Among the animals moving are animals like Upland Chorus Frogs Pseudacris ferriarum, Four Toed Salamanders Hemidactylum scutatum, and Marbled Salamanders Ambystoma opacum. However, the greatest migration is undertaken by the Spotted Salamander Ambystoma maculatum. This relatively large salamander spends the summer and fall in brumation, escaping the dry and the heat in underground retreats, waiting for ecological signals of the breeding season. When the cue of warm rain comes, the salamanders emerge in the thousands to return to the same pools they were born in, where, like their parents, they will engage in the same ritualistic breeding activity. The males are the first to enter the pond. Here, even without females to impress, they swirl around in the leaf litter at the bottom of the pond, dropping spermatophores (see video taken at the pond on Brakefield Road here). The female salamanders arrive a week or so later. Upon entering the pond the females are swarmed by eager suitors, each waving his pheromones in her face, and gripping her with their legs so as to entice her to pick up their spermatophore, thus passing on their genetic material. After fertilization, the females attach their eggs to a submerged branch, where they swell with water to form a firm gel-like mass. Females come and go fairly regularly, completing their purpose and leaving the pond to return to their forest home. Males tend to stay longer, attempting to breed multiple times, giving themselves a better chance at reproductive success. As the eggs hatch, the pond is filled with thousands of small, gill-flaunting larvae, who in a few weeks will leave the pond on a rainy night to find a place to spend the summer. Emigration of young salamanders from the pond represents a huge transfer of biomass from an aquatic ecosystem to a terrestrial one. This transfer is one of the most significant roles of amphibians in food webs and ecosystems. These salamanders make up a huge portion of the forest’s vertebrate biomass, and engage in one of the largest movements in the eastern forests of America, and certainly one of the largest here in Sewanee. All photographs copyright 2016 Saunders Drukker. This entry was posted in Salamander and tagged salamander, sewanee on March 4, 2016 by David George Haskell. I’m delighted to share this guest blog post written by Saunders Drukker. Saunders is an Ecology and Biodiversity major at Sewanee (Class of 2017). He’s been studying salamanders and other herps for years. I hope you’ll enjoy his observations and photographs. As the days here in Sewanee start winding down toward winter, many nature lovers’ subjects begin to disappear. Birds make their way south, mammals start looking for places to hide until spring, and trees go dormant, leaving many of us struggling to find things worth searching for. Thankfully, as everything else goes away, one group begins their most active period of the year: salamanders. Each year in winter salamanders become active by the thousands, moving about the forest floor searching for places to breed. 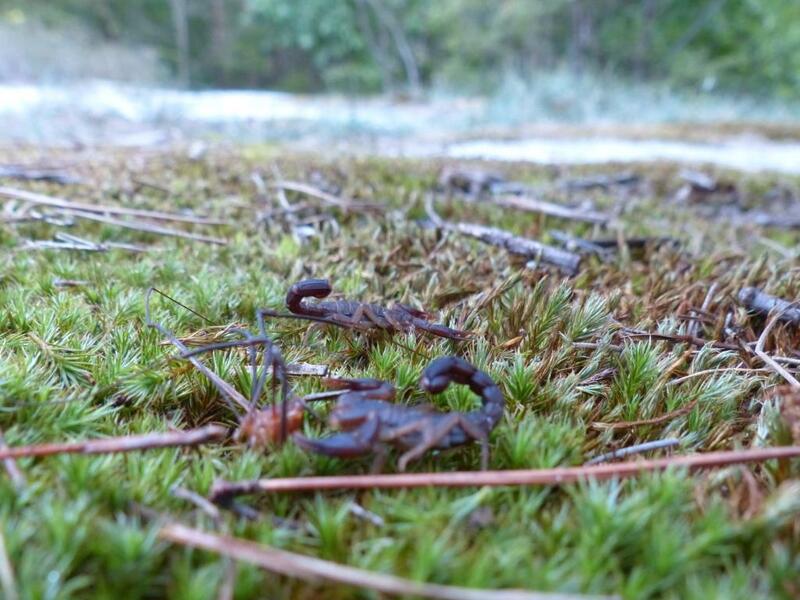 One of the main groups active at this time year is the Ambystomatids or Mole Salamanders. These stout little amphibians spend much of their year hiding underground, but when the weather cools down and the rains start up they begin to move toward their ephemeral breeding ponds. One of the most striking and most active at this time is the Marbled Salamander, Ambystoma opacum. These salamanders come out from their underground hideaways and move to the locations of ponds before these depressions fill with water. Here, the salamanders breed and lay eggs in the muddy bed of the pond, where they guard them until the rains come. Once the pond fills with water, the adults return to the forest. The eggs hatch, filling the pool with thousands of larval salamanders. By laying their eggs in the pond before all the other species arrive, the Marbled Salamanders give their young quite the advantage. By hatching earlier than all others, larval Marbled salamanders become large enough to prey upon the smaller larval Spotted Salamanders Ambystoma maculatum once they arrive in spring. It is not just the mole salamanders moving this time of year, though. The cool wet weather is ideal for almost all species found here on the plateau, especially the lungless species that require cool, wet conditions to be active. These salamanders, as their name implies, do not respire by use of lungs, instead they take oxygen from the environment around them, using their permeable skin to transfer oxygen and carbon dioxide. Some of the most easily found genera in Sewanee are Plethodon, Pseudotriton, Eurycea, Aneides, Hemidactylum, and Desmognathus. On any rainy cold night large numbers of these salamanders can be found moving across the forest floor, or even across roads, so keep an eye out when you’re driving on backroads. Sewanee boasts a huge diversity of salamanders, and winter is by far the best time to go out looking for them. All text and photographs on this post, copyright Saunders Drukker, 2015. This entry was posted in Salamander and tagged salamander, sewanee on December 15, 2015 by David George Haskell. After my students turned in their latest assignment — a creative piece on “place” — I asked them to represent the form of their writing through a few wordless chalk marks on the board. They also summarized the main themes of content and form in a couple of sentences. This was improvised work: no preparation, go to the board and write. The diversity of their subjects (what is “place”?) and the divergent ways in which they chose to represent the flow of their writing is intriguing and encouraging. I’m very pleased when I see a set of assignments that have emerged from the particularity of the students’ experiences, rather than from a template. Bring on the grading! Click on any thumbnail image to scroll through examples of their work. This entry was posted in Literature and tagged creative writing, sewanee on November 24, 2015 by David George Haskell. This week I asked my students to create erasure poems from five chapters of Findings, Kathleen Jamie’s fabulous collection of essays on “the natural and unnatural world.” An erasure poem retains the words and word order of the original, and removes all but a small portion of the text. The task for the students, therefore, was to read the essay with close attention to the particularities of each word, while keeping an eye on how these words build into meanings and stories. The exercise is one more way of attending to a text, then using this attention to create new work. An inward movement, listening, then an outward gesture of response. We ended the class by reading the resulting poems aloud, with silence between readings. I found the readings particularly interesting and beautiful: hearing familiar and esteemed essays through the ears and minds of my students. Click on the thumbnail images below to view a slideshow of the students’ work. This entry was posted in Literature and tagged creative writing, erasure poem, findings, kathleen jamie, sewanee on November 10, 2015 by David George Haskell. Thanks to the work of University of the South Executive Chef Rick Wright, along with his colleagues, local foods are gracing our dining hall. This year, the University will use about 20% of the food-purchasing budget in the local farm economy, a flow of $300,000. A few years ago, that number was zero. Next year, we’re on track for 30%. This Sunday, fried chicken, along with squash from the University farm, was on the menu, a celebration of the fall harvest. Thank you Chef Rick Wright, Farm Manager Carolyn Hoagland, and the many staff, students, and administrators whose work is reorienting campus dining away from the outlet pipe of the industrial food system and toward Tennessee’s fields. This entry was posted in Archosaurs and tagged farm to table, local food, sewanee on November 9, 2015 by David George Haskell. Extreme makeover for the curriculum: we tossed out the lectures and replaced them with embodied experience. Students in Field Investigations in Biology (one half of our introductory biology course sequence) have for several years now been tromping the woods, measuring skulls, and poking around in the sewage treatment plant, experiencing ecology, evolution, and biological diversity through feet, noses, ears, and hands. Why not use the apps that came installed (free!) in our bodies. We’re not yet brains-in-jars. One of the sites that we visit is near Sewanee’s “Piney Point.” Near the point is a sandstone outcrop, home to plants and animals with a taste for lichen-crusted pizza stones. The exposed rock blazes. Fence lizards bask, Cladonia lichen crinkles. Limbs shed from drought-twisted pines provide cover for animals on the hottest days. To supplement this meager shade, we’ve lain a few small plywood boards at the site. The boards are class-lures. There is nothing like prepared spontaneity. Let’s lift the board: oh my, scorpions! Who knew? During last week’s class, Kirk Zigler, my colleague and fellow poker-under-boards, found not only solitary scorpions, but paragons of arachnid family values. I had to scuttle out there to see for myself. 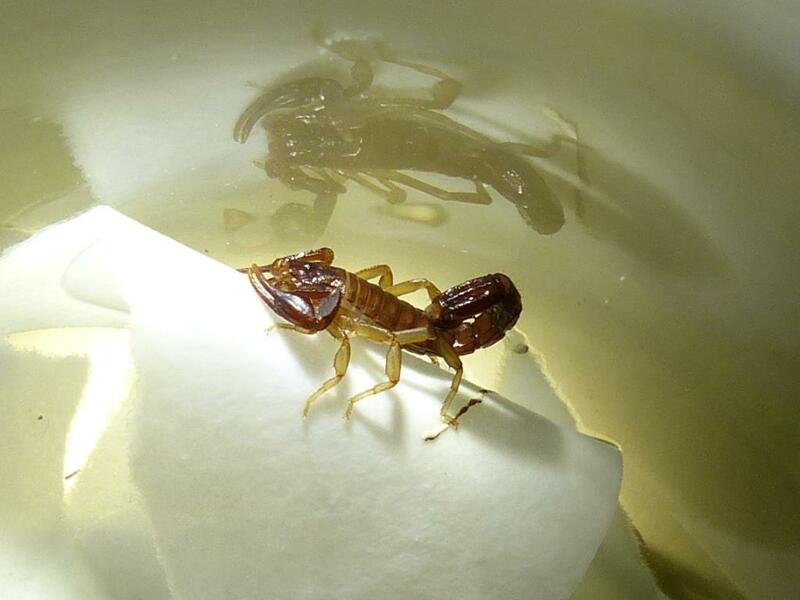 Scorpions jockeyed by their babies. The youngsters cluster on their mothers’ backs, finding refuge under the stinger. Each juvenile has its own curled, spiked tail. The overall effect is a jumble of gramigna pasta. The dish simmers with enough promise of spicy mouth-feel to deter even the more reckless eater. 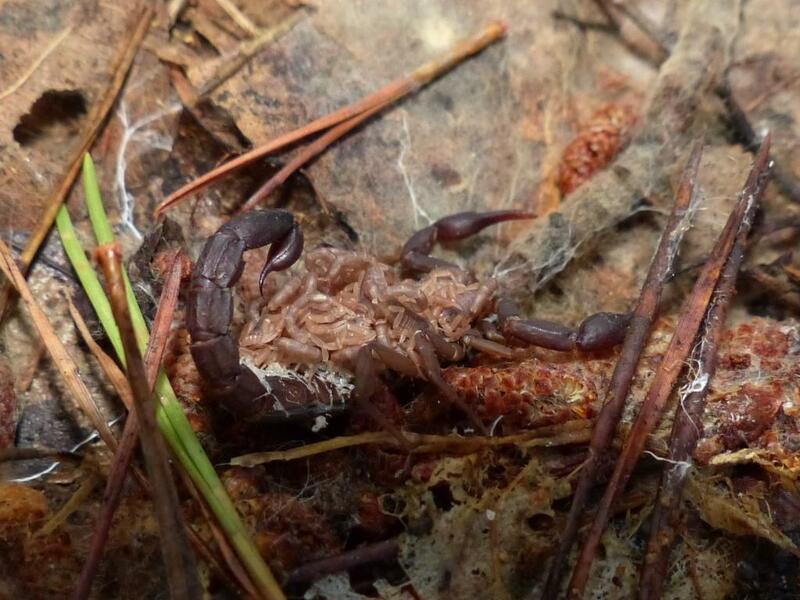 Where-ever exposed rock meets jumbles of downed wood, scorpions will thrive. If your house happens to sit next to such a site, expect guests. Lydia Boroughs saved one such creature for me to show-and-tell in class and then photograph. 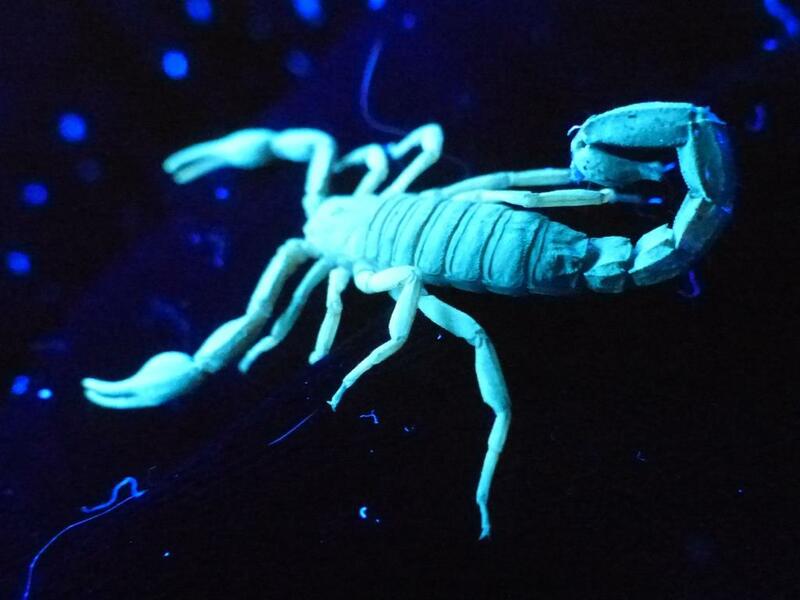 Ring-like molecules in scorpions’ exoskeletons snare the ultra-violet light, then throw it back as a blue-green glow. It’s unlikely that such a trick evolved just to amuse bulb-wielding primates. One explanation is that the glow lets scorpions receive and detect low levels of light, using their exoskeleton as another “eye.” When UV light levels are high, scorpions hide, sitting out the bright day and sunset. Even when white light is absent, the animals detect and respond to ultraviolet. This is a curious arrangement, but no stranger than the rest of the scorpions’ visual system. Scorpions have both median and lateral eyes. The median eye sits in the center of the “back” and forms images of high visual acuity. The lateral eyes vary considerably in number from species to species and are used to perceive subtle differences in light intensity at night, presumably letting scorpions orient as they forage at night and calibrate their daily clocks. The UV-gleamed exoskeleton shines into these lateral eyes, opening a new dimension of vision. In searching for the latest information about scorpion eyes, I discovered that the most comprehensive study of their evolution and taxonomy was recently published by Stephanie Loria and Lorenzo Prendeini. Stephanie is a friend and former student now completing her PhD on scorpion biology at the American Museum of Natural History in Manhattan. Peering under cover-boards on Sewanee’s sandstone can be addictive… and lead to some interesting places. 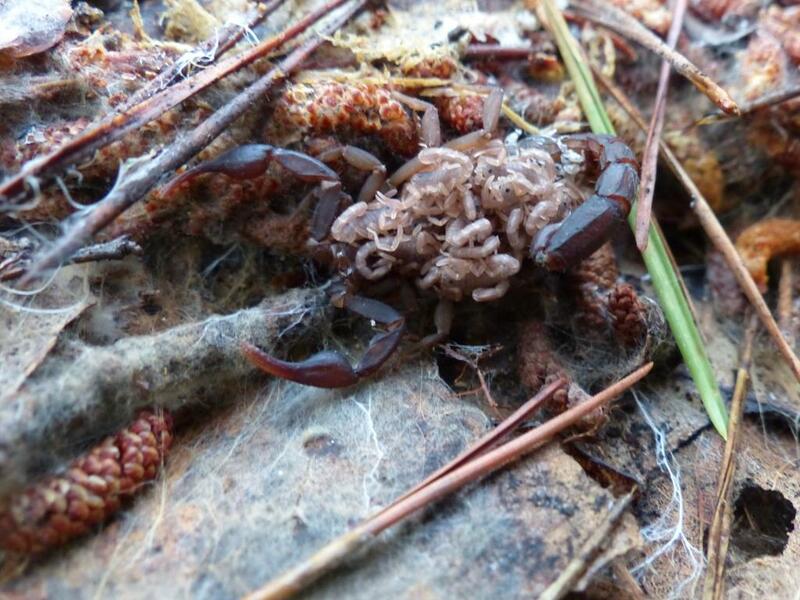 This entry was posted in Arachnida and tagged scorpion, sewanee on September 24, 2015 by David George Haskell. I recorded the Sewanee annual firework display at a lookout spot across a mountain cove from the detonations. Before the pyrotechnics, the katydids made my ears ring, but the explosions out-shouted even the combined acoustic power of tens of thousands of singing insects. If you listen with earphones, you’ll hear the low-frequency roar of the fireworks rushing down through the mountain cove for five long seconds after the blast. From where I sat at the Proctor’s Hall rock, the echo ran from right to left, flowing down, like a dark bird launching from the cliffs to the fields below the cove. Thank you to the Sewanee Volunteer Fire Department for their annual extravaganza of sound and light. This entry was posted in Bioacoustic revelry and tagged acoustic power, firework display, mountain cove, sewanee, Sewanee Volunteer Fire Department on July 12, 2015 by David George Haskell.